Planting is always an exciting time. To see new life spring up and grow fascinates me. I love to start our plants from seeds, it is part of the gardening fun. With the purchase of our hydroponic Tower Garden a whole new gardening method opened up to us. Now planting a garden is not limited to spring anymore, we can grow a garden 365 days a year! And plant new plants over and over again. 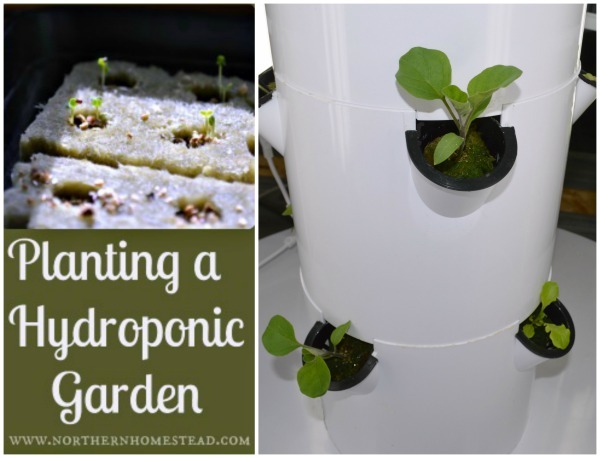 It was a steep learning curve on how to start plants for hydroponic growing. As always, I like to share with you what I learned. What I share here is for the Tower Garden, but can be used in other hydroponic systems as well, check out the Kratky Hydroponics Way. Since hydroponic / aeroponic is not using any soil, we do not plant seed in soil. The Tower Garden came with rock wool starter cubes and Vermiculite to cover the seeds to keep them moist. Rock wool is maybe the most popular hydroponic growing medium and for good reasons, it simply works. But you can also use Oasis Rootcube, Rooter Plugs or any other hydroponic growing medium of your choice. The planting medium has to be a bit smaller than the net pots. The Tower Garden net pots are 2 inches in diameter. In a usual container garden you would not be able to grow a big plant like a tomato in a 2 inch pot. That is different with aeroponics. As long as there is room in the system for the roots, the pot can be small. Rock wool needs to be soaked in water for a few minutes up to a few hours until wet throughout. Especially if your water is very acidic, you can soak the wool in a lower PH water – the water will neutralize the PH. Rock wool has a PH of its own that is a bit higher, you can use the PH down or simple a lemon to lower the PH in the water. You want the wool to be moist, not wet. So after soaking let the water drip off a bit. Now you are ready to plant. 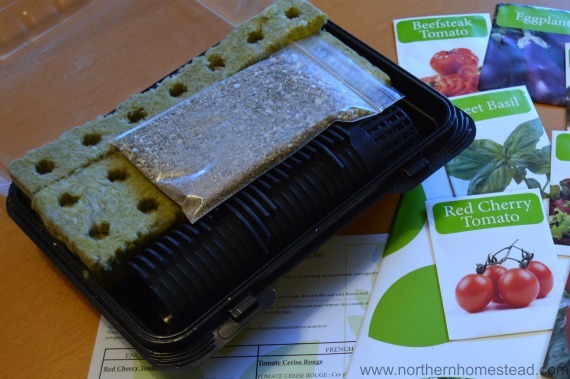 The seeds for hydroponics are just the same as for any gardening. You might want to try new varieties depending on where the garden will be. Plant 1-3 seeds in one hole to make sure one germinates. If more plants germinate, thin them out bey cutting them close to the growing medium. Since many seeds are very small, a toothpick can help to plant them. Wet the pick in some water and the seed will stick to it. Now you can plant the seeds precisely. There is no need to waste seeds. After adding the seeds to the hole, cover them with some vermiculite. 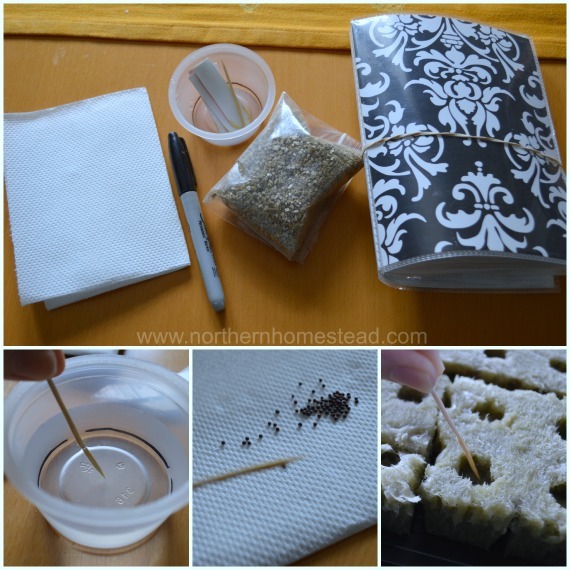 Do not overfill the holes, the idea is just to help keep the seed moist. Now spray each hole with a little water. You can also add a little water to the bottom of the tray to add moisture. Seeds need warm temperatures to germinate, not so much light. Find a warm spot in your house. The top of a fridge would be a better place than a cold but bright window. Some have great results by placing the tray on top of a heating vent in the winter. You want about 85 degrees (Fahrenheit) for fast germination. A Germination Station with Heat Mat can be helpful too. To speed up germination you can also sprout seeds before planting them. I use the Biosta sprouter . Especialy in the winter I find it helpful to sprout seeds. Sprouted seeds are a bit sensitive. If you just plant the dry seeds they will sprout and grow whenever the conditions right. If you sprout them prior to planting, you have to make sure the conditions are right at all time till they become robust little plants. Keep them moist and warm with lots of light. As soon as your seed germinate, they will need sunshine or a grow light. 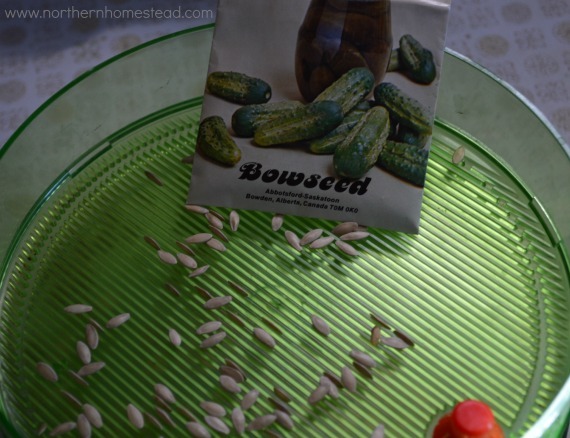 Keep your seeds and seedlings moist by adding about 1/4 inch of water each day. Once your seedlings start growing true leaves, water them with hydroponic nutrient solution. It is tempting to grow several plants in one rock wool cube. However, we have learned that this is not a good idea, even if the plants are small. In fact, we have lost a whole Tower to over planting. If you have multiple seedlings in one rock wool cube, thin them out to just one plant per cube. You will end up with healthier plants and a cleaner root system in your garden. Use garden snips or scissors and cut out the crowded seedlings always leaving the healthiest plant. In 2-4 weeks, when your seedlings are about 3 inches tall, they are ready to be planted into the hydroponic / aeroponic garden. It is not so much the size of the plant, more a healthy root system that is growing out of the rock wool cube that we are looking for. To insure there are health roots growing out of the net cup you can plant the seedlings into the net cups prior to planting them into the system. This is especially helpful for plants who have tiny roots at planting stage, or if the seedlings for some reason need to wait longer to be planted. In any case this little step will give you healthier roots. In the video below I explain it in details. If you have a hydroponic greenhouse selling seedlings nearby, you can purchase the seedlings instead of growing your own. 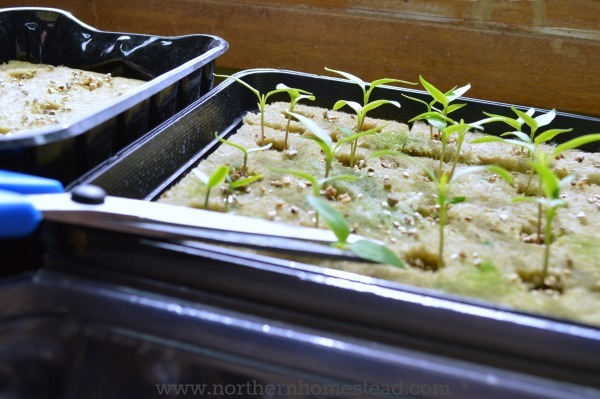 You can also buy normal seedlings to use in a hydroponic system. Choose seedlings that have a longer root system. Now gently wash all the soil off of them. 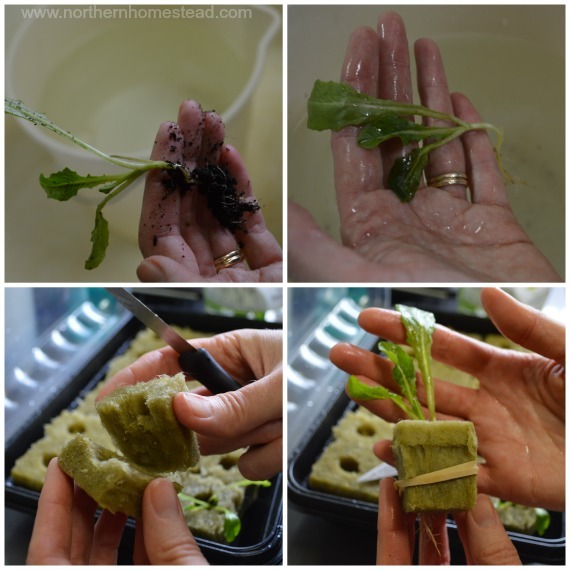 Cut a rock wool cube in half and place the seedling into it. Lay the other half on top and hold them together with a rubber band. If planting strawberries, make sure to have the crown above the rock wool. Note of caution: By bringing in seedlings you might bring in some diseases or insects, too. There are many plants that grow great from cuttings (Basil, Tomatoes, Peppers…) and the hydroponic garden is a great place to grow them. After taking a cutting you can simple put it into the rock wool cube so the end is showing on the other side. Keep the cube moist and the cutting will grow roots. Or you can place your cuttings as per usual in a glass of water (I have had great results with this), and when roots are established proceed planting it like a seedling. 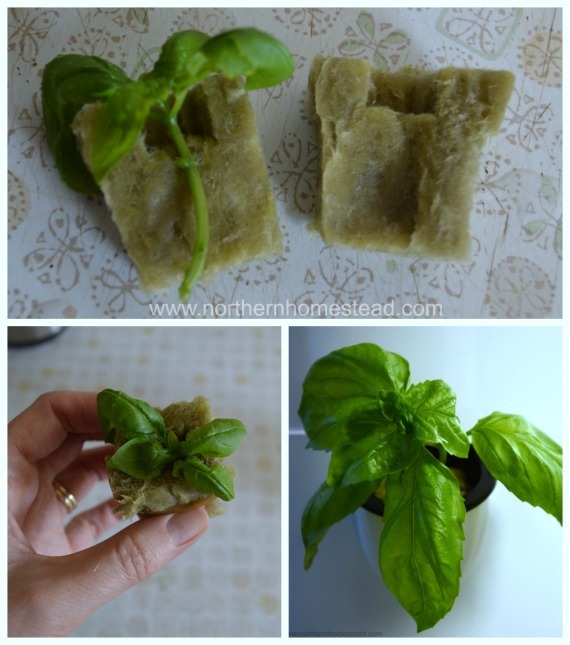 Cut a rock wool cube in half and place the cutting with an established root system into it. Lay the other half on top and hold them together with a rubber band. Your seedlings are ready to be planted into the system, when you can see the roots growing out of the rock wool cube. In our tower garden system we push the cubes a bit down into the net pots. Roots that do not reach the watering will dry out and die. To prevent that see the video above on how to grow healthier roots. In a vertical system like the Tower Garden, make sure to plant smaller plants on top and bigger, heavy plants with a massive root system at the bottom. This way you will insure a good water flow and also have an easier time supporting the bigger plants as they grow. Also if you have a problem with insects like aphids, plant plants that are known to be liked by them (like herbs and cabbage family plants) at the bottom, this way they will stay mostly on those plants and not go all over the garden. You can even grow a trap for insects with some beautiful nasturtiums. Nasturtiums attract many insects, meaning if there are any in your garden they will be on them and not in your salad. Generally speaking, labeling your plants is very important. How else will you remember what was planted, what did well, and what you should never grow again ;)? Labeling the rock wool cubes can be a bit challenging simply because of their size. Little homemade labels out of a milk carton or a diagram on a peace of paper works well. Most of the time though, I prefer to make a list of things I planted. This is not as accurate, but still works well for the purpose. Since plants grow in aeroponics system much faster than they do in soil, you will need to start new seedlings approximately every 8 weeks for fast growing plants like letuce. The hydroponic / aeroponic garden is a real green food machine, so keep on growing. This was super informative! I know nothisng about gardening like this. I can’t wait to see them grow. I had no idea they grow faster. After the initial investment of the tower, how expensive is growing this way? And what could one do in a situation with little natural light? You will always need the mineral blend, cost $40 and you can grow with that about 200 salads, that’s 20 cents per salad. For indoor gardening or low light gardening there are grow light available that fit perfectly on the Tower Garden, making year round growing possible. It looks like you were able to plant a good variety to have fresh food. I’m looking forward to the growing and harvest process of your new system. How clever to repurpose a milk carton for making your labels! I love to repurpose things, it just makes sense. The plants are growing nicely while it is still snowing outside, so fun! It’s amazing that you can have more than one plant per cube with some of the veggies. I’m looking forward to see how fast your plants grow. This is a new way of planting for me and I’m mesmerized. It was all new to me too. I am a dirt gardener, but it is not complicated to learn, and fun to see how great things grow. I am fascinated by the amount that we can grow in such a small space. I’m so glad you posted this information. My mother and I were just discussing this and now i can share this with her. You are welcome Mary, glad to be of some help! Hmm, yummy strawberries! A Tower Garden with strawberries would be so fun! i love hydroponics! 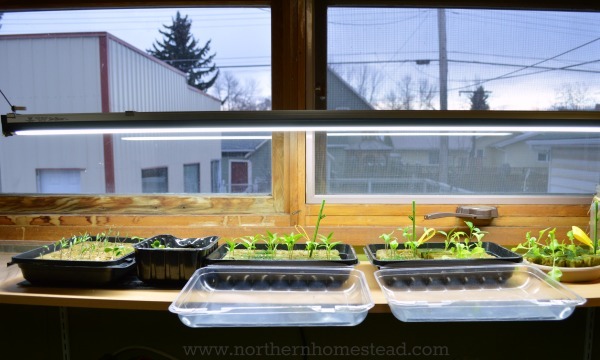 I really would love to setup a system in my house so this post was really useful 🙂 I really need to look into grow lights though because I don’t have a great sunny area. We use aeroponic with grow lights, it works great. The Tower Garden offers grow lights too. Great tutorial. You make it look so easy! I’d probably screw it up, but it looks like you did a great job! There is not much that you can screw up, since there are many ways to do it and it is so easy. happy gardening! Yep, you do not need a green thumb to do hydroponic. It makes gardening a lot easier, but you still have to care for your plants. Love all of your information! It is very informative. We are out in B.C and are considering the TG as we do not have the space for dirt garden. If we grow greens, herbs etc indoors do you have to have lights? Any luck with tomatoes indoors during winter months using lights? Do you have to order items out of the US? Thank you for all of your time in showing others how to be able to source their own food. Hi Carrie, thank you for your kind words. Yes you do need lights growing indoors. If you have a big window facing east or south, you might be able to grow tomatoes, people do. You can order everything from our Canadian Tower Garden website: esau.towergarden.ca. Let me know if you have more questions. You are so creative! 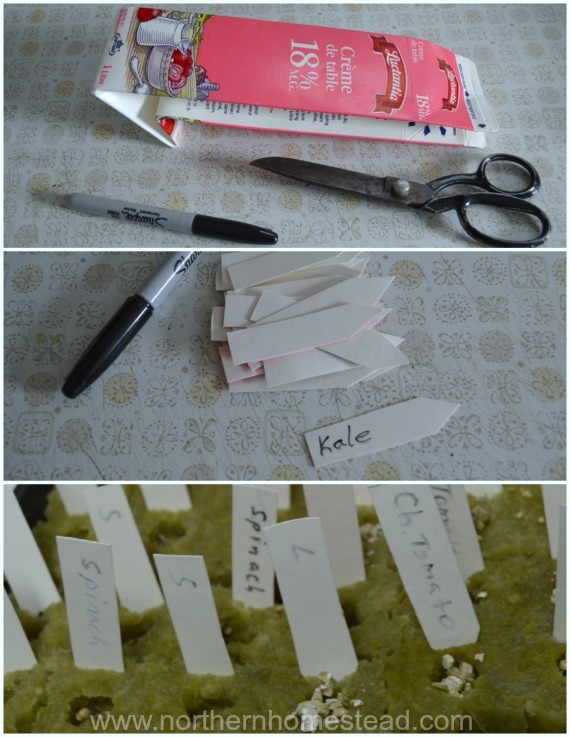 I love how you were able to make labels for your plants using old milk cartons. I think that’s a great way to find some stocky paper to use while recycling at the same time. That’s what I’m going to use to label my hydroponics garden from now on. Looks easy enough. I need to get into hydroponics. It sure is, a clean and easy way to grow indoors.